The riverside of the City of London had for centuries, by the Tudor period, been busy with ships and smaller vessels coming and going. Quays and warehouses lined the north bank of the river from the Tower up to London Bridge and further and goods were moved by porters up and down the narrow streets that descended to the river. No doubt the sails and masts of vessels on the river could be seen from many points in the town. London’s maritime trade with the Continental countries had risen steadily during the 12th and 13th centuries but had been hard hit during the period of the Hundred Years War that ended in the mid-1400s. From the latter part of that century commerce, such as the importing of French wine and the main exports of wool and cloth, began rapidly to rise again and growth continued during Tudor times. By 1500 about forty five percent of England’s wool and seventy percent of cloth exports were passing through the Port of London, much of it to Antwerp and Calais. There were many cloth-finishing workers around the Antwerp area, with a ready market for un-dyed, unfinished English broadcloths. 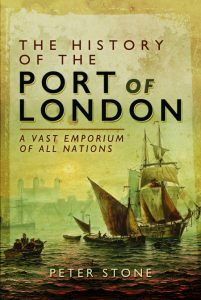 Throughout the medieval period foreign merchants, often with superior ships and monopolies in certain goods and markets, dominated trade in and out of London. One such group was the Hanseatic League, or Hansa. They were a confederation of merchants from towns across northern Europe, from the Low Countries to Russia, and centred on Lübeck, who monopolised trade in the Baltic area. In 1493 Henry VI banned Flemish merchants from trading in London, a move that favoured the Hanseatic League who obtained the right to import Flemish cloth. This caused a riot by the London merchants who had previously traded with the Flemings and the Hansa’s London base at the Steelyard in Upper Thames Street was attacked and temporarily destroyed. The Hanseatic League’s dominance gradually declined and Englishmen began to replace foreign merchants in the port. A group of London traders known as the Merchant Adventurers emerged in the 15th century, dominating the booming business in English cloth to Antwerp, and Letters Patent were drawn up in 1505 to bring them together as a single joint-stock company. A ship-building and repair industry, as well as associated trades such as rope and sail-making, had existed in London since Saxon times. As the city became more congested those enterprises moved further downstream. By the 14th century they were located in riverside hamlets at Ratcliffe, Shadwell, Limehouse, Poplar, Blackwall and Rotherhithe where ships could be pulled up on mud berths. Work on naval vessels was supervised by the Clerk of the King’s Ships who was based close by at the Tower of London. A Company of Shipwrights trade guild was established by the 15th century with their own meeting hall at Ratcliffe. When Henry VIII was at war with France he found it inconvenient that his navy was based at Portsmouth, far from the Royal Armoury at the Tower of London. He decided that the ideal locations were close to his palace at Greenwich, at the Kent fishing villages of Deptford, Woolwich and Erith, which were also easier to defend than Portsmouth. These yards came to employ men with ship-building and repairing skills and there was a need for local suppliers and administrators with suitable knowledge. Initially the facilities on the Thames were rather small but Henry invested heavily in the navy and they grew ever larger and better-organised. During his reign the King’s Yard at Deptford expanded to thirty acres, including two wet-docks, three slips large enough for warships, forges, rope-making and other facilities. All these factors created an enlarged industry that was not only useful for naval shipping but for the wider Port of London. The area to the east of London therefore grew to become the ship-building capital of England at the end of the 16th century. New methods of ship construction had been introduced at the end of the previous century, changing from the old ‘clinker’ to the newer ‘carvel’ type. With larger ships also came the introduction of more sails, with more than one mast to support them. These new ships were more robust, with greater manoeuvrability, of larger capacity, faster, and cheaper to build. By 1545 all ships built on the Thames were in the new style. Increased shipping on the Thames, and accusations that some dishonest pilots were being paid by rival merchants to run ships aground, created a need for new rules and standards to prevent accidents. A group of masters and mariners petitioned Henry VIII that regulation of pilots was required. From its foundation by royal charter in March 1514 responsibility for safety on the river was given to ‘The Master, Wardens and Assistants of the Guild or Fraternitie of the most glorious and blessed Trinitie and Saint Clement in the parish Church of Deptford Stronde in the County of Kent’. Trinity House, as they became known, were given the responsibility to provide pilotage – the safe guiding of ships by experienced pilots – along the Thames, particularly through its shifting sandbanks in the Estuary. Their work was funded by a levy on vessels entering the port, collected by Custom House in London. The only ship-owners not obliged to use their services were the Hanseatic League. Queen Elizabeth extended the responsibilities of Trinity House. By the middle of the century they were involved in a number of river-related activities such as the provision of buoys and beacons to mark safe channels, the supply of ballast and (from 1566) the authorisation of Thames watermen. Trinity House continues to be responsible for lighthouses, buoys and navigation in modern times. Trade became difficult for English merchants in the mid-16th century. Largely blocked from trade with the Baltic area by the Hansa’s monopolies and by hostilities between England and France, they relied heavily on the wool and cloth trade with Flanders and the Low Countries. Edward VI was petitioned to support the English merchants and in February 1552 he revoked the League’s rights in England and the Steelyard was seized. Two years later the Hansa’s rights were restored once more by Queen Mary. When the Hansa attempted to block English grain exports to the Low Countries English merchants petitioned Queen Elizabeth. In 1598 the Hanseatic League were given two weeks to vacate the Steelyard that they had occupied for several centuries and it was closed, becoming a naval storehouse.